It is only fitting that my first male Burlesque performer in the spot light should be the Daddy of Finnish Burlesque, yes I was lucky enough to spend some time in the company of the Helsinki HotDog Frank Doggenstein. I have to say this man is a true gentleman, and it was a pleasure to sit and chat over a coffee (little secret he had a latte, but don’t tell him I told you) with him. Soon you can see him in action at this years Sinsational Spring Awakening in Helsinki (25th May 2013), so until then enjoy In The Spot Light With Frank Doggenstein. (T.T.Tassel) Where did you first find out about Burlesque? (Frank) Bettie first found an ad for a book in 2004 and showed it to me about 10 minutes later, and we both said “ wow this is exactly for us “. (T.T.Tassel) What inspired you to become a performer? (Frank) I always wanted to be a performer, a rock star or musician, but I am unable to sing or play an instrument. Then I thought, well burlesque is suppose to be for anyone so why not men. (T.T.Tassel) Would you say that Burlesque has changed your life in any way? (Frank) YES. I have met a lot of people, people who think the same way as I do. That is possibly the biggest change. I have always been very quiet, confident, but this has added to that and taught me to be me. (T.T.Tassel) Who has been or still is the biggest influence in your life? (Frank) Probably my grandfather, who unfortunately has been gone for many years. I have always looked up to him; it is hard to put into words. (T.T.Tassel) What is your favourite performance of your own? (Frank) Frankenstein, as your very first performance idea carries all your hopes and effort, you put so much in, so for me that is the one. Plus he is harsh but still gentle. (T.T.Tassel) How did Hell Monty come into being? (Frank) We had a workshop with Major Suttle-Tease, that went so well that he returned a few months later. We had another workshop and we made a number for one event. After that we decided to continue with Hell Monty. (T.T.Tassel) Hell Monty has just added a new Member, so how does Hell Monty select their members? Frank) We do not seek new members, but if we see someone who stands out and we think they should be a member we will approach them. (T.T.Tassel) Recently Finland had its very first all male Burlesque evening, how do you feel that was received by everyone? (Frank) I was surprised how well it was received. The media got behind it and it has taken off really well. We was not sure how it would go and how many would come to see it. So we were very pleased. 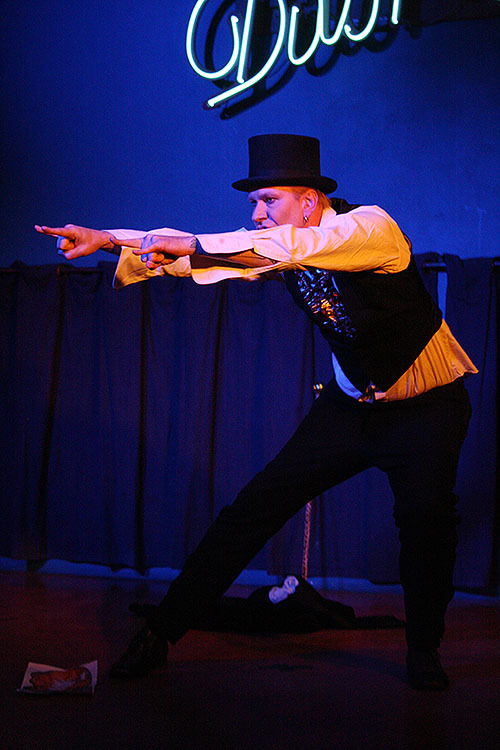 (T.T.Tassel) Would you like to see more male performers joining the Finnish Burlesque scene? (T.T.Tassel) What one piece of advice would you give to anyone starting out in Burlesque? (Frank) Go and see performances, learn from watching what is good, what is bad, what works, and what does not. Try and see international performers as well. Seeing live is different from videos, it might take time but it is worth it. This way you learn the basics, you must learn the basics. I had a really enjoyable time with Frank, and I hope you found it as interesting as I myself did. A big thank you to Frank for taking time out of his busy schedule to honour me with this interview.